Her agenda is wonderfully ambitious. As Amy Kahn Russell puts it, "I try to have something for everybody," noting in the next breath that that goal is not always possible. 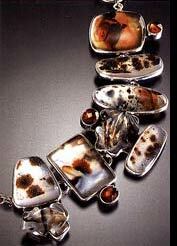 Some of her pieces are bold and brash, yet she also produces smaller scale jewelry for the more conservative customer. "I’m only five feet tall and I wear quite big things," she explains, but intimate and discreet are also part of her jewelry vocabulary. Another aspect of Russell’s mission is to make "art to wear" that is affordable to many"instead of making it really expensive where only a couple of people can have it and enjoy it," she argues. At the same time, her fondest hope is that her jewelry will be kept forever, collected and treasured, transcending "trends and seasons." While her jewelry is one of a kind, Russell will often produce a particular group that offers variations on a theme or arrangement. The coloring of the stonesay, turquoisewill vary from brooch to brooch even as the configuration remains similar. These bodies of work are related directly to the available supply, be it a batch of fine freshwater pearls, a collection of Oriental scrimshaw or a cache of Vaseline glass beads from the African trade. Russell actively seeks unusual components and artifacts from around the world, including South America, Australia, China, India, and the American west. When it comes to semiprecious gems, she sometimes helps friends with seed money to buy rough stones and cut them to her specifications. Some of the tourmaline from Africa was mined specifically for her. "I actually started my business from a lot of antique things," Russell recounts. 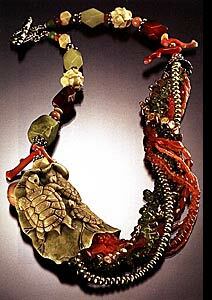 She collected Asian pieces while living in Hong Kong and developed a passion for Chinese and Tibetan art. 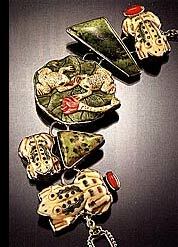 She uses antique porcelain, jade, enamel, silver and ivory in her work. She will pair up pieces of jade for a stunning set of earrings or frame an antique floral silver piece in one of her signature pin pendants. Her early work was almost one hundred percent ethnic. Today, it continues to earn the adjective exotic. Oftentimes, the found objectsbelt buckles from China, purse handles from Japanwere not intended to be jewelry, so Russell modifies them, transforming them into ornamental elements. Among those objects are the menuki she collects. Menuki are part of Japanese sword handles, usually found in matching pairs but also "orphaned." Russell also integrates netsuke, fan holders and African beads and carvings into her work. 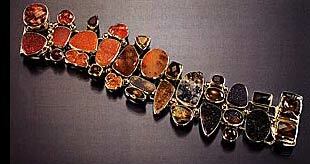 Among Russell’s favorite materials is boulder opal from Australia. She loves its array of colors, from purples and blues to yellows and browns. The same passion for color variations draws her to tourmaline, to red and purple amber from Africa, to rainbow pyrite from Russia, which, she says "naturally has a lot of fire in itreds and greens and golden hues." The jeweler’s excitement about her work is palpable when she starts talking about her materials, whether it is handcarved vesuvanite ("it’s unusual to hard carve a semiprecious stone," she says) or citrine, which she uses as "accent drops." Her jewelry often falls under the heading of "naturalistic." She uses a lot of natural mineralsamethyst, jasper, drusy quartz and agate, cinnabar, hessonite, carnelian, gaspeitewhile avoiding, for the most part, glass, plastic and other manufactured material. 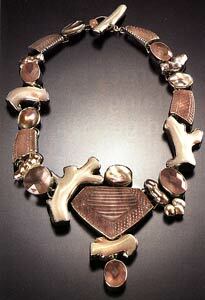 She often incorporates fossils, shells (nautilus, abalone and spiny oyster) and corals. "My interest," she states, "has always been in an organic fashion." 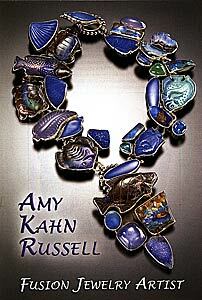 Amy Kahn Russell was born in Tennessee but grew up in Baton Rouge, Louisiana. She studied art at Newcomb College, a part of Tulane University in New Orleans that is renowned for its ceramics. Her parents, as well as her grandmother and great-grandfather also attended Tulane. Russell owns a piece of Newcomb art pottery given to her grandmother, who was in the class of 1912. At Newcomb, Russell focused on bronze casting, but also studied lithography and drawing. For her junior year, she attended Exeter College of Art in England, which sharpened her focus. After earning her bachelor of fine arts, she took graduate courses at Louisiana State University and the University of Houston, working toward a master’s degree in studio art. This year marks Russell’s thirty-fifth in the field. She began at age sixteen selling jewelry in a department store. After college, she and two of her father’s friends opened a business called Fiddlers Three. They bought materials and designed necklaces and bracelets, which were sold to stores and individuals, wholesale and retail. Moving to Houston, she managed the Fine Jewelry department at Sakowitz, handling gold and precious gems. Russell continued her involvement in the field after moving to Hong Kong with her husband, Scott Russell, a consultant in human resources. During their three-year stay, she managed a wholesale pearl and jewelry outlet. She also did commission work, including trompe-l’oeil paintings in gouache and acrylic, with dragons a favorite subject. More significant to her growth as a jeweler, Russell absorbed the art and culture of her surroundings, falling in love with the temples and complex carvings. She also became a collector and remains one to this day. Everything from Japanese embroideries to Tibetan purses, ink sticks used for Chinese calligraphy to gold weights from Africa caught her eye. After returning stateside, the Russells lived in New York and New Jersey before settling in Wilton, Connecticut, about a half-hour ride by train from Manhattan. It proved an excellent place to raise a family. Son Joshua, now twenty-one and attending Brandeis University, is a political activist who has done work in Cambodia and Jamaica. Nicholas, age seventeen, is also on an international circuit, as a snowboarder. The couple manages to keep up with their kids: last year they visited Cambodia and Thailand with Joshua and watched Nicholas compete in the snowboarding nationals at Copper Mountain in Colorado. A lot of Russell’s jewelry skills were self-taught. She learned a little bit in college and a bit more while at Exeter College of Art in England. Over the years she has taken courses, including a wax-making workshop with modelmaker Kate Wolf in Maine. Her knowledge of casting has come in handy. "I like combining three-dimensional and two-dimensional and color," she notes. Russell fantasizes of one day creating small-scale sculptures that would incorporate jewels and semiprecious stones. In creating an ornament, Russell begins by arranging the various elements on a worktable, moving them around, eventually taping them in place. "It’s a question of colors and shapes," she says. After coming up with a design, she then makes a drawing of the configuration, with notes, which can be used as a template. She knows there are computer programs available for this part of the process, but she prefers to draw by hand. "I try to mix minerals and cultures and colors to get the effect that I want," the jeweler states. That effect? Dazzle and beauty, with a good deal of ingenuity and versatility mixed in. "All of my pieces have loops on the back so you can wear them with a choker wire or a chain, or you can wear them as a brooch, or you can pin them to beads," Russell explains. Likewise, her earrings can be converted from pierced to clip. Russell demonstrates how a recent necklace combines a pin pendant with two bracelets. The bracelets hook together by magnetic clasp to form a short or long necklace, depending on the wearer’s preference. The clasp can be worn in the front or back. The multi-purpose user-friendly ornament incorporates boulder opal, chalcedony (mined in Namibia) and Brazilian agate drusy. The opal is natural, not dyed, and has been cut and polished. It is sometimes hand carved into animal shapes, including fish, frogs and turtles. "The carvings go back to my sculpture and art interests," Russell says. Animal imagery is quite predominant in her jewelry. "I’ve always had a fondness for lizards and frogs," she notes. Dragons have also been a favorite motif, going back to college days. Russell also carves chalcedony, which is unusual, creating leaf and other, more abstract shapes. Sometimes a theme will emerge, such as seashells and fish. Working with a particular palette, she often mixes abstract and representational elements. A recent necklace includes smooth, highly-polished coral, moonstone and freshwater pearl. Mother of pearl has been carved into a flower shape. One necklace that doubles as a pin pendant is accented with chrysoprase, an apple-green chalcedony, mined in Australia; apatite, a natural, variously-colored calcium phosphate and blue topaz. Sterling silver serves as the main armature material, but Russell also uses gold on occasion. Another specialty of this multi-threat jeweler consists of necklaces made from many strands of beads in different colors. She creates thin ones and thick ones depending on the customer’s desireunderstated or "something full and major and big." A recent piece features handcarved vesuvanite with peridot, freshwater pearls and citrine, all bezel-set on a clasp. The beads are citrine, peridot and freshwater pearl. "You can twist it," Russell explains, "and the more you twist it the shorter it becomes." 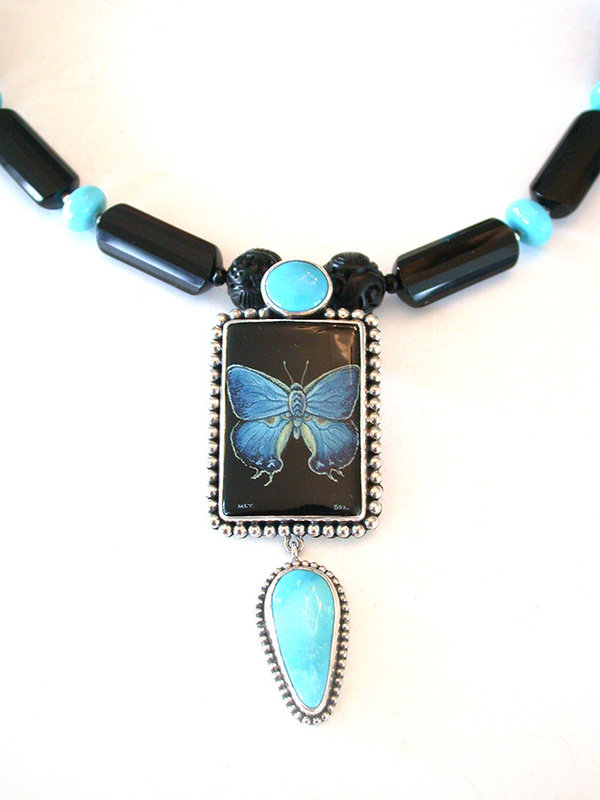 The piece comes with a pin pendant that can be attached to the beads. The time it takes to make a piece of jewelry, from design to completion, varies a great deal, but generally it is about three months total. At the same time, certain functional elements, like a magnetic clasp Russell developed, require years of trial and error. Russell does an occasional special commission, trying to accommodate customers and collectors. A lot depends on the availability of the materials, especially where there is a request for something that has already been sold. Such special orders sometimes take a while to fill as the jeweler tries to fit them into the middle of other production work. The main part of the business is wholesale. Russell sells through catalogs and to jewelry shops, boutiques, specialty stores and high-end art galleries across the country and in Europe. Larger stores like Nordstrom’s, Marshall Fields and Saks Fifth Avenue carry her work. She has an extensive presence on the web, with her own site, online trunk shows and a multitude of jewelry dealers showcasing her work. Russell and members of her staff attend six to eight craft expositions each year including American Craft Council shows and Buyers Market of America. "I go through periods when I don’t have as much time to spend on marketing as I should," she remarks. "I do everything: design and cut and sell." The studio, which is being expanded, is pretty much in a constant production mode. Russell manages a staff of twelve, a mix of full- and part-timers, including high school students. "I always have a lot of projects going on," she says with a laugh, surveying a somewhat chaotic-looking workstation. She will sometimes start a project, then walk away from it, often not returning for several weeks or months. "Sometimes it takes time to get the kinks worked out," she notes, speaking from experience. On the other hand, new work often goes quickly. Celebrity collectors, including Madonna, Iman, Halle Berry and Mary McFadden, have placed Russell’s jewelry in the limelight, as have appearances on television (soap star Linda Dano has worn her pieces) and in the movies (Tess Harper sported her jewelry in Dirty Laundry). The work has also been featured in Vogue, Essence, Mademoiselle and Glamour magazines and exhibited at a number of esteemed venues, including the American Craft Museum, the Smithsonian Institution and the Asia Society. Russell mentions these successes in passing. You get the feeling she would rather talk about smoky topaz or fossilized ivory. 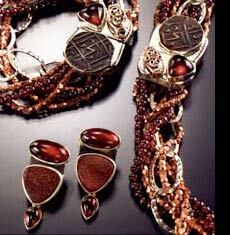 When asked about the astonishing range of her materials, she answers simply, "They keep it interesting." Russell is too modest to say, "I keep it interesting," but that is what she does, one beautifully exquisite ornament at a time. I received the Amy Kahn Russell bracelet. Wow! It is even more beautiful than I imagined and fits perfectly. Thanks again for your help!